Improve your Profile: Set up your personalized LinkedIn URL. Network and Connect: Send connection requests to at least two former colleagues. 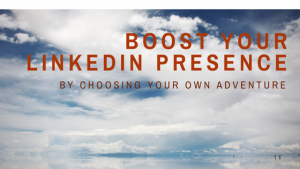 Create Content: Read your LinkedIn news feed and comment on someone else’s update. Improve your Profile: Review your headline and current job position/description and make any updates/changes. Network and Connect: Spend 15 minutes reading and responding to other people’s status updates — without posting a new status update for yourself. Create Content: Post a request for advice or assistance in a LinkedIn Group. Network and Connect: Reconnect with someone on LinkedIn and invite them to meet up with you “offline” (in person). Create Content: Interview someone in your industry and post it as a LinkedIn Publishing post, or start a discussion in a LinkedIn Group of which you’re a member. At one point, attending networking events and meetings were the best way to make connections and build relationships. Now, these activities have moved online to such communities as LinkedIn. LinkedIn offers a platform to specifically search for and research individuals who can directly add value to your job search. Employers and recruiters also use LinkedIn to locate both active and passive jobseekers as well as vet job candidates before an interview or extending an offer. With it being such an important job search tool, take a few minutes to choose your own adventure and develop your LinkedIn presence. Laurie is a TORI award-nominated Certified Master Resume Writer who works with senior professionals and rising executives to turn job search stress into job search success. Click here to receive a copy of her 4-point Formula for an Interview-winning Resume.